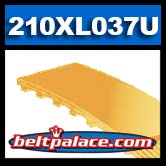 210XL037U Polyurethane Timing Belt. 21” Length. 105 teeth. 3/8” (0.37”) wide. Polyurethane (orange plastic) Heavy Duty replacement “210-XL Series” industry standard Timing Belt. Popular replacement belt for electronic equipment and power tools such as power sanders, woodworking tools & lathes, pumps, and robotic equipment.